The drawback to Einstein’s Special Theory of Relativity, however, is that it is “special” in the respect that it only considers the effects of relativity to an observer moving at constant speed. Motion at constant speed is clearly a very special case, and in practice, bodies change their speed with time. Einstein wanted to generalize his theory to consider how a person sees another person who is accelerating relative to them. At around this time (1907), he also started to wonder how Newtonian gravitation would have to be modified to fit in with special relativity, and how the effects of gravity could be incorporated into the formulation. His resulting General Theory of Relativity, over ten years in the making (it was published in 1916), has been called the greatest contribution to science by a single human mind. Initially, Einstein had been puzzled by the fact that Sir Isaac Newton’s Law of Universal Gravitation, which had stood undisputed since 1687, appeared to be fundamentally incompatible with his own Special Theory. Newton’s theory (permanently linked, at least in the popular mind, with his observation of an apple falling from a tree) stated that every massive body exerts an attractive force on every other massive body, a force which is proportional to the product of the two masses and inversely proportional to the square of the distance between the bodies. Thus, according to this theory, gravity is relatively strong when objects are near each other, but weakens with distance, and the bigger the bodies, the more their force of mutual attraction. This “inverse-square law” is quite sophisticated enough to explain why a cannonball fired horizontally travels further before hitting the ground the faster it is launched, why a certain minimum speed (about 11.2 kilometers per second) would be required to allow objects to break out of Earth’s gravity and into orbit and why the planets travel in an elliptical orbit around the Sun (although not quite sophisticated enough to predict the slight anomaly in Mercury’s orbit). Gravity is the organizing force for the cosmos, crucial in allowing structure to unfold from an almost featureless Big Bang origin. Although it is a very weak force (feebler than the other fundamental forces which govern the sub-atomic world by a factor of 1036 or 1,000,000,000,000,000,000,000,000,000,000,000,000), it is a cumulative and consistent force which acts on everything and can act over large distances. So, even though gravity can be effectively ignored by chemists studying how groups of atoms bond together, for bodies more massive than the planet Jupiter the effects of gravity overwhelm the other forces, and it is largely responsible for building the large-scale structures in the universe. Thus, gravity squeezes together massive bodies like our own Sun, and it is only the explosive outward energy in the Sun’s ultra-hot core that holds it in hydrostatic equilibrium and stops it from collapsing into a super-dense white dwarf star. Even before Newton, the great 17th Century Italian physicist Galileo Galilei had shown that all bodies fall at the same rate, any perceived differences in practice being caused by differences in air resistance and drag. Galileo’s famous (and probably apocryphal) experiment involving the dropping of two balls of different masses from the Leaning Tower of Pisa was repeated with even more dramatic results in 1972 when a hammer and a feather were dropped together on the airless Moon and, just as Galileo had predicted, both hit the ground together. Newton, however, had assumed that the force of gravity acts instantaneously, and Einstein had already shown that nothing can travel at infinite speed, not even gravity, being limited by the de facto universal speed limit of the speed of light. 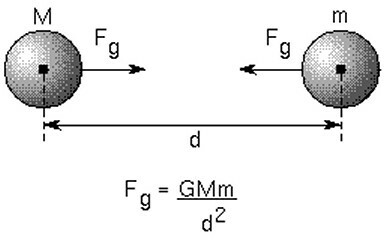 Furthermore, Newton had assumed that the force of gravity was purely generated by mass, whereas Einstein had shown that all forms of energy had effective mass and must therefore also be sources of gravity. Einstein’s ground-breaking realization (which he called “the happiest thought of my life”) was that gravity is in reality not a force at all, but is indistinguishable from, and in fact the same thing as, acceleration, an idea he called the “principle of equivalence”. He realized that if he were to fall freely in a gravitational field (such as a skydiver before opening his parachute, or a person in an elevator when its cable breaks), he would be unable to feel his own weight, a rather remarkable insight in 1907, many years before the idea of freefall of astronauts in space became commonplace. A simple thought experiment serves to clarify this: if an astronaut in the cabin of a spacecraft accelerating upwards at 9.8 meters per second per second (the same acceleration as gravity imparts to falling bodies near the Earth’s surface) were to drop a feather and hammer they too would hit the floor of the cabin simultaneously (in the absence of air resistance), exactly as would have happened if they had fallen on Earth under gravity. That, and the feeling of his feet being glued to the ground just as they would be in Earth’s gravity, would be enough to convince the astronaut that the acceleration of the spaceship was indistinguishable from the pull of gravity on the Earth. The influence of gravity also creates effects of time dilation (see the section on the Special Theory of Relativity for a more detailed discussion of time dilation), sometimes referred to as "gravitational time dilation". As Einstein predicted, the closer a body is to a large mass, with a commensurately large gravitational pull, the slower time runs for it. It is almost as though gravity is pulling on time itself, slowing its progress. Gravitational time dilation also raises the theoretical possibility of time travel. For example, if a spaceship were to orbit close enough (but not too close!) to a hugely massive object such as a supermassive black hole, the gravitational effects may be significant enough to slow down time for the occupants compared to elsewhere, effectively allowing them to travel into the future. 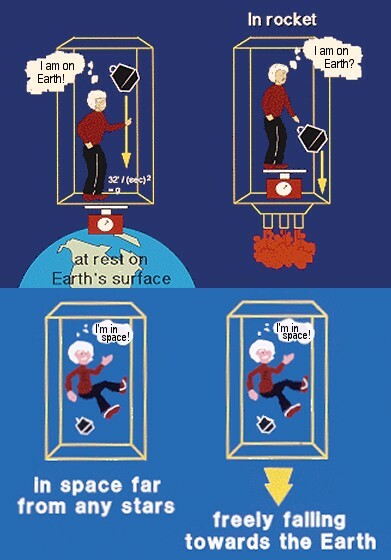 On a much smaller scale, because gravity is slightly stronger closer to the center of the Earth, then theoretically time passes more slowly for someone living on the first floor of an apartment block than for someone living at the top. With modern atomic clocks of sufficient accuracy, differences in the passage of time at different altitudes above sea level (and therefore different distances from the Earth's center of gravity) can be measured, and even the tiny differences due to the changing shape of the Earth as the tidal force of the Moon pulls and stretches it. A real-life example of gravitational time dilation can be seen in GPS systems in geosynchronous orbits above the Earth, which need to constantly adjust their clocks to account for time differences due to the weaker gravity they experience compared to that on the Earth's surface (it is estimated that their accuracy would be out by as much as 10 kilometers a day without this adjustment). So, gravity, Einstein realized, is not really a force at all, but just the result of our surroundings accelerating relative to us. Or, perhaps a better way of looking at it, gravity is a kind of inertial force, in the same way as the so-called centrifugal force is not a force in itself, merely the effect of a body’s inertia when forced into a circular path. In order to rationalize this situation, though, Einstein was to turn our whole conception of space on its head, as we will see in the next section.